Most people seeking a piece of fruit know it's as simple as stopping by their local grocery store to find what they're looking for. Citizens of North America have grown accustomed to the usual apples, oranges, pears and bananas that come from far-away destinations, given the restrictive seasonal conditions much of our northern hemisphere faces. There are, however, a small number of people that refuse to succumb to the humdrum fruit selection at grocery stores, instead seeking odd and interesting fruits from the far and remote places elsewhere on our planet. These people are the subjects of The Fruit Hunters, a documentary from director Yung Chang, which explores the curious world of these obsessive fruit enthusiasts. Similar to David Gelb's Jiro Dreams of Sushi, which explored the dedicated craft of sushi, Chang encapsulates the passionate love affair some individuals have with fruit, vividly showcasing some of the world's most exotic specimens on-screen in an attempt to induce salivation from the audience. This visual feast is based on Adam Gollner's bestselling book of the same name, which, like the doc, addresses issues such as preservation, global commerce and genetic modification while tethering it to the human relationship with fruit over the centuries. While the film's primary focus is on the fruit itself, it eventually evolves into an examination of human passion and curiosity, as well as the connection between Mother Nature and humankind. 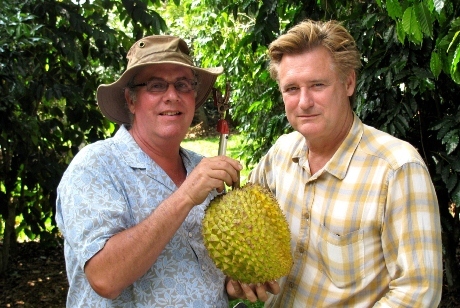 An appearance by actor Bill Pullman furthers this by offering his personal story to the film, describing his crusade to create a community orchard in his own Hollywood neighbourhood.